16 Mad 'MOM MOMENTS' That Are Guaranteed To Make You Laugh! 16 Mad ‘MOM MOMENTS’ That Are Guaranteed To Make You Laugh! Any woman out there who successfully manage to spawn her own ‘belly fruit’, will tell you…it’s not easy! Not only is the nine months of pregnancy pretty darn tough, but it certainly gets no easier after that! In fact…it only gets harder…and then the realization hits you that this little human being that you somehow grew in your gut, is now going to be your full responsibility…. FOR THE NEXT 18 YEARS! Stop the mother train, I want to get off! Take it away, cool Moms! 1. Good Enough To Eat! We all know how tasty smelling some chapsticks can be! Well, this Mom obviously didn’t take this factor into consideration when giving one her child….hmmmm…..yummy! 2. Nothing is sacred anymore…. This Mom obviously forgot that when you have kids, anything fun, or of value needs to be kept OUT of reaching distance…like on top of the Eiffel Tower maybe? Also, nothing that can create a chaotic mess should be left anywhere near a child…. if a child see’s ‘Baby Powder’ then obviously he or she will think it’s magical, messy glitter made just for them…which I guess it is…just don’t envy the clean up on this one! 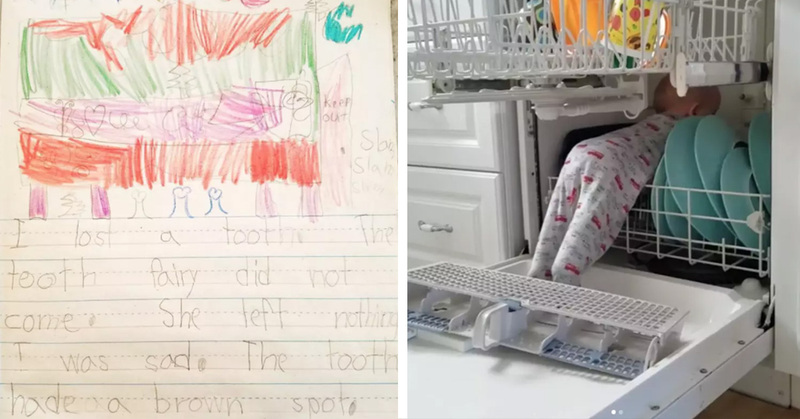 This Mom must have been tired of the bath-time tantrums… just stick em’ in the dishwasher, that’ll be easier! Probably best not to try this one at home though! Probably not the best idea to store your kid’s lost baby teeth in the with food products… might give the odd person a bit of a fright! Unlike this Mom, who obviously forgot about the teeth altogether! Oh well, at least the Tooth Fairy got the blame, instead! The perks of motherhood…gotta feel sorry for this kid, though! She’ll probably have a thing against fairies for the rest of her life! 7. Errrr, plastic melts…you know? This poor Mom was only thinking about her children’s dental hygiene….so much so, in fact, she forgot all about her childhood Science lessons…which included the fact that plastic will melt if boiled….who knew!? White is a terrible color to keep clean at the best of times, so, what was this Mom thinking when she put white pants on her toddler!? I don’t know…maybe she just enjoys doing the laundry!? Leaving anything sweet unattended is risky business at the best of times! But leaving a freshly cooked brownie cake alone near children was just asking for trouble! It seems a lot of Mom’s are prone to forgetting the ‘leaving sweet things unattended’ rule! Weird, really, as you’d think that would be rule numero uno for anyone! Poor doughnut, it didn’t even get a proper chance at being eaten…you don’t just eat the topping off like that! How could you, kid!? You’ve really got to hand it to this Mom for being so trusting! Oh well, at least she now knows never to trust anyone…ever again! She didn’t quite nail it here…did she? Something definitely went wrong… even I’m a bit confused here to be honest! At least she can say she tried…she failed, but she tried. This isn’t that bad really…a Birthday is always cause for congratulations in my opinion, think about it, we’ve managed to keep ourselves alive for another year! 15. I made pancakes for dinner…sort of! 16. I give up, pass me the wine! There’s a reason why wine is a favorite among most Moms, sometimes, it’s the only thing that stops them from smashing their heads into a television screen! This Mom obviously has some determination left at the end of her ‘epic fail’ day…well done, Mom! There’s always a way to open a bottle of wine! !